Zantedeschias or Callas are attractive summer flowering plants which are not hardy (apart from aethiopica) but can be protected over winter for flowering the following year. 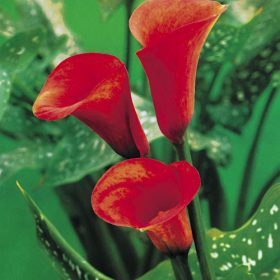 Callas are best grown in a sunny well drained area. If your soil is heavy add compost and grit to the soil before planting. Zantedeschia Captain Safari has flowers which are a wonderful orange-red colour, very vibrant with top dark green glossy leaves. Ideal for summer containers. Creamy white flowers with the inside a purplish mauve, quite stunning.